Our family knows from first-hand experience your heartbeat for the Gospel and your love of the students in your charge. You are an authentic Shepherd Leader, and I am encouraged to know that you are training others to be the same. 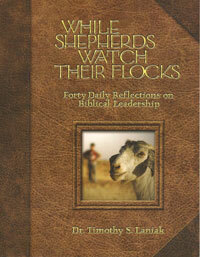 What Christian leaders are saying about Dr. Laniak’s award winning book, While Shepherd Watch Their Flocks, now in its fourth printing. Of the leadership models in Christ’s ministry, only the servant model has received any in-depth treatment. Laniak's book helps remedy this lack, providing a detailed treatment of the Shepherd Model  something that is desperately needed by today's Christian leaders. Tim Laniak has superbly woven together the biblical theme and the culture of the Near East. Most importantly, when much of what passes for Christian leadership is made up of secular models, with some biblical texts thrown in, this book models for us godly leadership as shown in Jesus - the Chief Shepherd! Real-life stories of the rugged nomadic lives of shepherds bring to life numerous Scriptures to teach us the hard lessons of leadership. Leaders are called to be not only tender and loving, but also tough and disciplined. Almost forty years ago Philip Keller wrote a soul-opening book, A Shepherd Looks at Psalm 23. The journey in the following pages will take you beyond that devotional classic. With insightful words and splendid photographs, Laniak brings both a scholar's mind and a pastor's heart to his writing. A warm, winsome, and captivating forty-day journey to Godly leadership. It makes me, as a parent and Christian leader, want to follow the Shepherd more closely, as I seek to be a shepherd after God’s own heart. I’ve always loved the biblical image of the shepherd leader, but Tim Laniak’s work has helped me see it in an entirely new way. I am particularly struck by the way shepherding connects with peacemakingit is vital for church leaders not only to have a shepherd’s tender heart, but also to have the courage to protect and the wisdom to guide their flocks. Tim Laniak has brought so many fresh, helpful insights into shepherding, so much so that I gave copies of his magnificent book to each of our elders and program staff. It’s a great book! John A. Huffman, Jr., Chairman of the Board, Christianity Today; Former Senior Pastor of St. Andrews Presbyterian Church, Newport Beach, Calif.
Books on leadership are everywhere but this one is different: Tim Laniak gives perspectives on ‘shepherd leadership’ drawn from biblical insights, first hand cross-cultural living amongst shepherds in Bible lands, and contemporary applications. This unique blend written in short chapters gives the reader space to contemplate the important truths being conveyed. A unique contribution to the literature on leadership with a delightful combination of readability, scholarship and usefulness. I highly recommend the book for everyone seeking to understand biblical leadership, especially for those involved in multi-cultural leadership. While Shepherds Watched Their Flocks presents many descriptive images to enhance and expand one's view of ministry… The implications of the statement, "We are shepherds," needs to be grasped by those functioning at every level of Christian leadership, particularly those in administrative roles. Inspired by our Christian heritage and rooted in the Word of God, Laniak unpacks for his reader the reality of a shepherd’s life in parallel to today’s pastor and ministry leader. Remarkable for many reasons, it’s a prized addition to the leader’s library and coffee table. Accomplishing what few authors can, Laniak creates powerful images with fascinating stories, exegetical insights, and stunning photos, bringing biblical leadership to life for pastors and lay leaders alike. I recommend this theologically integrated, visually stimulating, and thoroughly spiritual journey for today’s shepherd leaders. More than an inspirational read, this book is a timely invitation into the shepherd’s world which will compel you to reflect on your Christian life and leadership with a new sense of awe and assurance. Be prepared to be taken deeper in your spiritual journey as you embark on this forty-day retreat. Laniak brings to life the realties and rewards of leadership by illuminating a centuries-old image. Reading his fascinating anthropological observations and rich scriptural insights will make spiritual shepherds anywhere in the world better leaders and better followers. In my work with Christian institutions training leaders in the majority world, I discern a scarcity of mature theological reflection on the person and practice of the leader. Because Laniak’s reflection is so deeply grounded in Scripture and its cultural context, I will recommend this work enthusiastically to Jesus’ undershepherds everywhere, who will find its orientation immediately relevant. In a day when leadership is often more about the leader than anyone else, Laniak helps us see our role as God’s undershepherds and our responsibility to care for those whom we lead. Laniak’s refreshing insights provide a roadmap for further reflection long after the 40 days of readings have been completed. Laniak invites us to pause beside still waters and consider forty inspiring and practical lessons at the intersection of biblical scholarship, organizational leadership and ministry practice. Anyone entrusted with ministry responsibilities will be treated to exceptional leadership insights, welcome guidance, and rare encouragement to renew their passion for attending to the needs of God’s flock. Believing that the shepherding task flows from a heart of compassion and a clear sense of justice, Laniak reminds us of the places, people, perplexities, priorities, purposes, and perseverance to which we are called. A spiritual quest that could have been written specifically for military chaplains who, like the Bedouin, travel barren wildernesses, self-sacrificially serve God’s people, and advocate for the lonely and lost. I enthusiastically recommend this book for institutional chaplains whose work is beyond the confines and security of the parish setting. After pastoring for twenty-five years and reading everyone from Covey to Kostenbaum and Friedman, I have never found anything as valuable for engaging the topics of pastoral leadership. A must read for those who desire to lead congregations and bring the essential values of the Kingdom beyond the parish to the world. Pastors and leaders need now more than ever a clear biblical perspective of what it means to be “shepherds after God’s own heart.” A most needed and timely book that warms the heart and lifts the spirit, for it is by no means easy being a pastor or leader today. More than a book on leadership theory, While Shepherds Watch Their Flocks is an invitation to undergo a cultivation process to become a biblical shepherd leader. Laniak writes with warmth and conviction, providing a mine of insights, reflections, and applications waiting to be unearthed! A refreshing devotional that draws the long time Christian leader back to first base… and equally equips the new pastor, elder or deacon who desires to remain faithful over the long haul. Tim Laniak draws upon the earthy experiences of real shepherds, exploring issues from the flock level up. He makes shepherding a difficult as well as an easy task - difficult because it requires everything we've got, but easy because it does not require anything else. Dr. David Wong, Leadership Mentor, Finishing Well Ministries, Singapore. A breath of fresh air for pastors and lay leaders alike. While so many leadership books focus on methodology, this book addresses the heart of ministry. Dr. Laniak masterfully rehearses the wide spectrum of pastoral theology that pervades the Scriptures. His personal experience among shepherds adds significant insight in understanding both Scripture and real life ministry. I'm recommending it as must reading for all my students! One responsibility of being an Elder is to make sure God’s people are nurtured, presenting God’s thirst quenching truths, and protected from the world’s false teachings. This book gives real life experiences, why God choose “shepherding,” and what it takes to fulfill that calling. Our pastors have been studying While Shepherds Watch together and are eager to share it with our leadership! Our Adult Ministry team is using this resource to equip their leaders to shepherd their small groups. Thank you for being faithful to what God has given you! Tim's study and writing of the middle-eastern pastoral context has brought the word "shepherd" forever out of childish simplicity for me. The way I see my job as a church leader, how I read the scriptures, and even how I see the Lord, my Shepherd, has taken on new and exciting depths. This book is a concise, intelligent and emotionally enriching picture that can be effectively used in the training of small group leaders who are, in effect, filling in as shepherd assistants. While Shepherds Watch Their Flocks is a powerful tool that conveys God's heart for each of his people to those who would help make those intimate connections in this culture of huge flocks and few shepherds. The books have indeed been a huge blessing! Our Session (12 elders, pastors, directors), along with Small Group Leaders, Youth Leaders, Staff Department Coordinators, Mission Leaders, Worship Department Leaders, and other key church leaders are reading through the devotional together. We have a Shepherd Leader Facebook page to which all participants (and their spouses) have been invited. Pastor Nate posts his thoughts each day, and each participant is invited to post his/her thoughts as well. Tim Laniak has taken the shepherd figure off the pastel flannel graph and fleshed it out in vivid language, amazing photos and challenging questions to prompt leaders in their journey to become like the Good Shepherd. While Shepherds Watch Their Flocks not only reminds us that we are His trusted under shepherds but also His cherished sheep.